Earlier this year, we introduced the Google Docs app for Android. Since then, many users have downloaded the app and enjoyed the benefits of being able to access, edit and share docs on the go. 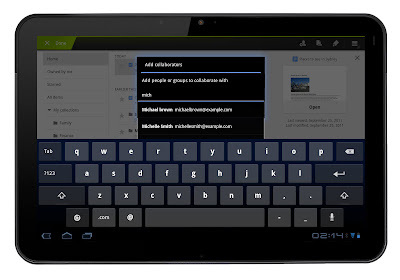 Today’s update to the app makes Google Docs work better than ever on your tablet. With an entirely new design, we’ve customized the look to make the most of the larger screen space on tablets. The layout includes a three-panel view, which allows you to navigate through filters and collections, view your document list, and see document details, all at once. Looking at the details panel on the right side, you can see a thumbnail to preview a document and its details before opening it. From the panel, you can see who can view or edit any doc. 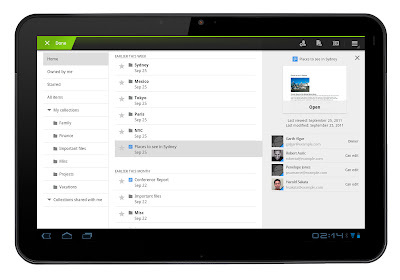 These features are now available in 46 languages on tablet devices with Android 3.0+ (Honeycomb) and above. You can download the app from the Android Market and let us know what you think in the comments or by posting on the forum. Learn more by visiting the help center. This really is a nice navigational update. Much better than the phone-style menu. What would really make this application exceptional is to have desktop-style editing available on a tablet. My tablet is similar in power to my Chromebook; can I at least choose to try using the desktop version, instead of being redirected to the error page? but where is the realtime collaborative editing? it is simply impossible to use! Has really noone notices the UI is exactly the same as feedly apps UI? Full screen mode for presentations? A nice post to inform about the new technology and the Android and Google Docs are both fantastic. So there combination can make a fabulous Business mobile phone to meet the requirements of the users. Good update and nice use of the extra screen real-estate of tablets. Been tinkering with it on my Galaxy Tab 10.1. Awesome work! Awesome, expect for us who dared to buy a tablet with android 2.x.x.. I'm finding myself more and more setting the 3rd party browsers user-agent to ipad (of all things) to see google pages in a nice way.. This is really some exciting news for android Tablets users, hope this will let us share our documents on google docs in a much more convenient way. I am working with a school system that is looking at introducing a tablet to all our students. We are looking at the Asus transformer but have concerns with google docs on the tablet. Our students are currently using google docs, but the tablet version is worthless for editing a document with ANY formatting or collaboration. This is a serious setback for us. If google can make their tablet interface as friendly as their desktop version, a lot of schools will plug kids into them. I can not think of better marketing. You are missing out on a large market, as Mr. Like points out. We are also looking at using an Android in our classrooms but the app doesn't allow for students to edit a doc that has been shared with them. Update please!